Our next talk is on Sunday 30th October at 2.30pm at Foulden Village Hall, in Foulden, Berwickshire, TD15 1UH. Map. 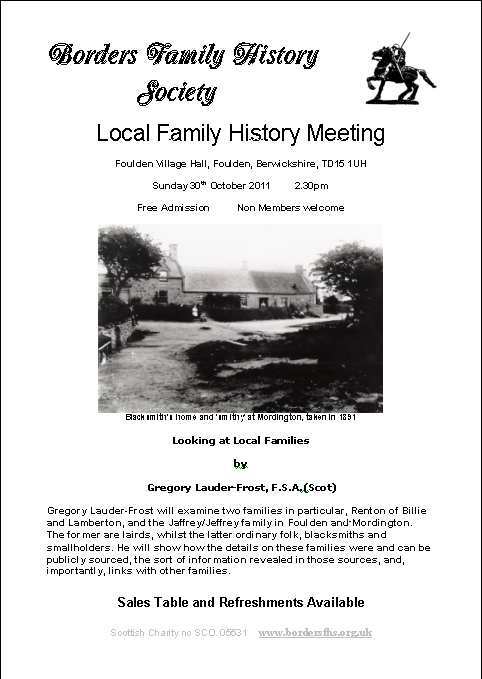 The speaker is Gregory Lauder-Frost, one of our trustees and a very experienced genealogist. He will examine two families in particular, Renton of Billie and Lamberton and the Jaffrey/Jeffrey family in Foulden and Mordington. The former are lairds, whilst the latter ordinary folk, blacksmiths and smallholders. He will show how the details on these families were and can be publicly sourced, the sort of information revealed in those sources, and, importantly, links with other families. Gregory is also the author of the Genealogies of Scottish Families CD. 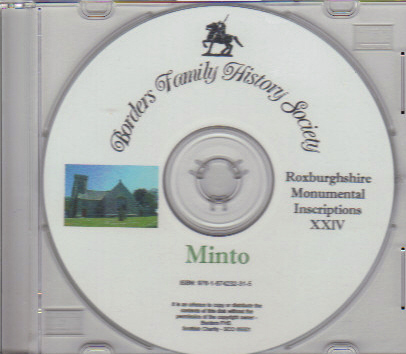 This contains details of over 36,000 people in the genealogical standard GEDCOM format. It includes ancestors and descendants who immigrated to Scotland, and emigrants from Scotland. However remotely, everyone on the CD is related to at least one other person on the CD. The main families included have the surnames Hay, Forbes, Lauder, Scott, Hamilton, Rutherford, Pringle, Douglas, Hepburn, Home but there are many others. The CD costs £45 (plus postage). To buy a copy, please contact Mary Thomson on the Contacts page using the contact type 'Order for Publications'. Have You a Piece of the Jigsaw ? 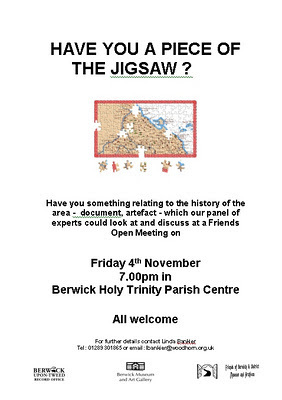 On Friday 4th November at 7 pm, the Friends of Berwick and District Museum and Archives are holding an open meeting in Berwick Parish Centre, Berwick-upon-Tweed, TD15 1DF, England. Map. Following the success of their August meeting, 'A History of Berwick in 10 Objects', when Anne Moore, the Museum’s Curator, and Linda Bankier, the Archivist, highlighted particular aspects of the Berwick and North Northumberland district’s history from objects in both collections, members of the public are being invited to bring items of interest to the Parish Centre on the 4th November, to add pieces to the jigsaw of the history of the district. This is not an 'Antiques Roadshow', and valuations will not be given. What the Friends are looking for are items which add to their knowledge of life and work experienced by previous generations – it could be an old wage packet showing how much was earned for a particular job before the last war, a household item no longer used, a timetable for a rail or steamer service which no longer exists, or something unearthed while digging the garden. 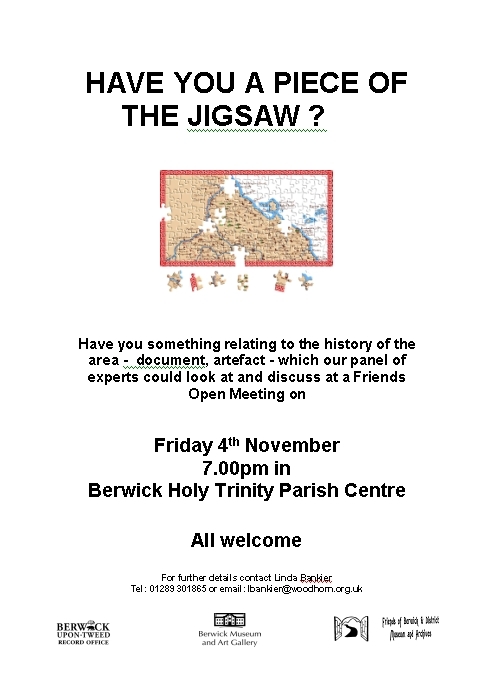 If you think you have something which could add to their knowledge, please ring Linda Bankier, on 01289 301865 by 31st October, and bring the item to the Parish Centre by 6.30 pm on 4th November, to allow time for them all to be set out and the experts to examine them before the meeting starts at 7 pm. Even if you don't have an item to take, it's worth going along and seeing what turns up. The Hawick Heritage Hub has an interesting blog about David Smith Cairns, who grew up in Stichill and went to Ednam school from 1873 to 1876, when he was almost 14 years old. He became Master of Christ’s College, Aberdeen and Professor of Apologetics and Systematic Theology. He and his brother, William, were the sons of David Cairns, the minister of Stichill United Presbyterian Church. Christ’s College, Aberdeen was a college founded by the Free Church of Scotland but is now part of the University of Aberdeen's School of Divinity. If you can get to Manchester, you might like to know that Fred Kennington is giving a talk with the title 'Fact, Fiction and Fairy Stories in the Borders' at the Anglo-Scottish Family History Society's meeting on 19th November. 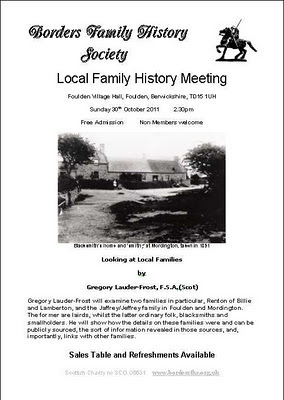 Fred was our previous membership secretary, he's written several books, and given very good talks to Borders Family History Society, so if you can get to Manchester, I recommend that you go to the meeting and hear him. 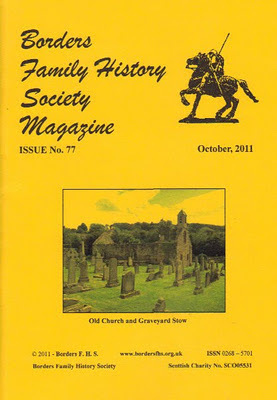 More about Anglo-Scottish Family History Society meetings.